In the INSPIRE samples, which collected monthly saliva for 6 months, 9 out of 20 subjects with MS (45%) shed EBV, i.e. had a detectable EBV virus in their saliva, on at least one occasion. Based on this data we are now able to do a power calculation of a trial to assess the ability of an antiviral drug to suppress EBV lytic reactivation in the salivary glands. Power calculation 1: Based on the conservative assumption that the antiviral drug will only be 75% effective in suppressing EBV reactivation over 6 months with monthly salivary sampling we will need at least 29 trial subjects per arm. This calculation is based on having a power of 90% and an alpha of 5%. Power calculation 2: Based on the conservative assumption that the antiviral drug will only be 80% effective in suppressing EBV reactivation over 6 months with monthly salivary sampling we will need at least 18 trial subjects per arm. This calculation is based on having a power of 80% and an alpha of 5%. In the Sheffield cohort, which collected monthly samples for 3 months, 44 out of 119 subjects with MS (37%) shed EBV, i.e. had a detectable EBV virus in their saliva, on at least one occasion. Based on this data we are now able to do a power calculation of a trial to assess the ability of an antiviral drug to suppress EBV lytic reactivation in the salivary glands. Power calculation 1: Based on the conservative assumption that the antiviral drug will only be 75% effective in suppressing EBV reactivation over 3 months, with monthly salivary sampling, we will need at least 38 trial subjects per arm. This calculation is based on having a power of 90% and an alpha of 5%. Power calculation 2: Based on the conservative assumption that the antiviral drug will only be 80% effective in suppressing EBV reactivation over 3 months, with monthly salivary sampling, we will need at least 24 trial subjects per arm. This calculation is based on having a power of 80% and an alpha of 5%. Goldani. Treatment of severe infectious mononucleosis with famciclovir. J Infect. 2002 Feb;44(2):92-3. We report a patient with severe acute infectious mononucleosis who was successfully treated with famciclovir. A 15-year-old male was admitted with a 6-week history of fever, malaise, generalized lymphadenopathy, and hepatosplenomegaly, the patient was acutely ill with a temperature of 39.0 degrees C. Oropharyngeal examination revealed enlarged tonsils partially obstructing the airways. EBV serology obtained during admission showed a positive Monospot test, virus capsid antigen IgM, 1:320, Epstein-Barr nuclear and early antigen, negative. After 72 hours of treatment with famciclovir(500 mg t.i.d. ), the patient was afebrile with important regression of the lymphadenopathy, enlarged tonsils and hepatosplenomegaly. Because acute infectious mononucleosis may be associated with extensive and prolonged disease, the potential therapeutic role of famciclovir in the treatment of severe forms of the disease deserves further studies. CoI: Team G are the recipients of a grant from Crowdacure that was used to perform this research. Prof G why don't you advertise for volunteers to help you with your workload? I am sure medical students would be keen to help and there are a lot of untapped skills in pwMS who are unable to work because of of premature medical retirement. I would be willing to help. Thanks for offering! Using volunteers to help is a good idea. 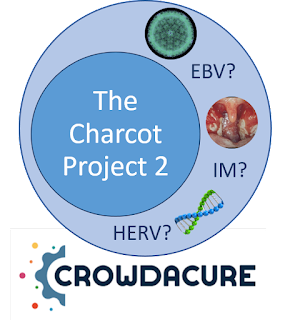 I sincerely hope that you are considering funding Charcot 2 via the same route. I is great to be part of something real. Thank you for your efforts and commitment. You have convinced me that EBV is the cause of MS. Finally, don't worry about being a bottleneck; you bottle seems to have a very wide neck. I seem always have a, "This is how much I need accomplish today" followed at the end of the day with a, "Well I managed get that and that done… But…"
I am happy (I think LOL) to hear the study produced results. I'll get the update online. As moves ahead towards the costing and such we are of course available as a resource that is at your disposal as always. I am the fourth in my familiy to get MS. My daughter has had a severe case of infectious mononucleosis. She doesn't have MS. Please hurry. Yes. Agree. I have 3 kids. There isn't a day go by that I'm fearful about their future. You have my full support (financial and othereise). Better a bottle of pure water than a barrel of contaminated stuff! The 3 or 4 winters leading up to my first relapses were dominated by repeated episodes of swollen glands/chills/sore throats/flu like symptoms. Month long episodes of viral chills in the afternoons and again in the evenings without any other symptoms. All most peculiar, it would start as soon as the temperature dropped in the autumn. It all stopped with dx though. Vit D was 19. Haven't had these feelings since and wonder if it was the Vit D issue or something else. Do you think that treatment of EBV/IM will reduce MS activity in those with progressive disease, also where "relapse" activity is low? yes..is any use to people who already got it ?? ?…is this a No both in theory and in practice so far..? prof g can you post a bit more on how you came about the patient numbers? it seems a bit low given repeated measures. It is not repeated measures; study subjects were only counted once. In other words if you shed once, twice or more in 3 or 6 months you were classed as a shedder. For the drug to work it has to convert a large proportion of these subject to non-shedders, i.e. every saliva sample has to be below the detection threshold of the assay. As less than 50% of study subjects are non-shedders they will be non-informative and not affect the results. Only the EBV shedders' will be informative. We could use a survival analysis, which will deal with this issue. But as shedding is intermittent this is not really appropriate. Our design is based on a biological question;'does FamV inhibit lytic EBV reactivation'? If you have a better trial design we would be interested to hear about it; particularly if it reduces the sample size and cost. Thanks. Honestly if EBV isn't the sole cause of MS, at least can be one of the causes. There are cases of MS in families, but as far as I read come to 20% of cases. I am, for exemple, just 01 cases in the whole history of my family, my family in general have cardiovascular problems. Sometimes I wonder if cases of MS among families also would fall in cases of subnotification, or misdiagnosis involving other diseases, for exemple ALD, or NMO, or Human T-cell lymphotropic virus type 1 (HTLV-1) -associated myelopathy, etc. In my city of almost 1.000 cases followed only know of 01 among um family, an aunt and a niece. The rest of the cases are isolated, at the moment. Why are less than 50% of study subjects non-shedders? Have they stopped being shedders?